Baturday News is a weekly blog written by Rachael, a 6th grade student and Save Lucy volunteer. 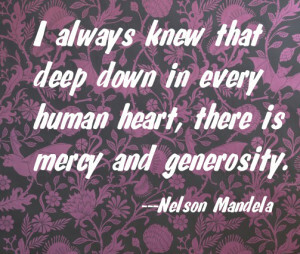 I would like to dedicate this week’s blog to Mr. Nelson Mandela. He was a great man from South Africa who helped his people. He died last week. I tried to find a South African folktale about bats, but I couldn’t find one. This is an African tale that I found at Pedagogy Ideas. It’s about a little bat who couldn’t make up his mind. So long ago that no one remembers why, the animals and the birds fought a war. The bat could not decide which group to join. As the bat watched, the birds seemed to be winning, so he flew to the side of the birds. “What are you doing here?” demanded the birds. “You are not a bird.” “See my wings?’ asked the bat. The birds accepted him. Unfortunately for the bat, the birds were being tricked by the animals. The animals won the war. The bat flew to where the animals were. “What are you doing here?” demanded the animals. “You are not an animal.” “See my teeth?” asked the bat. He opened his mouth and showed his little fangs. The animals chased him away. Maybe some of them had seen him with the birds. The birds saw him coming back from the animals, and would not have him back. No one accepts the bat now. He still hides from everyone during the day, and only flies about when he can hide in darkness. Next StoryIt’s Been a Great Year!